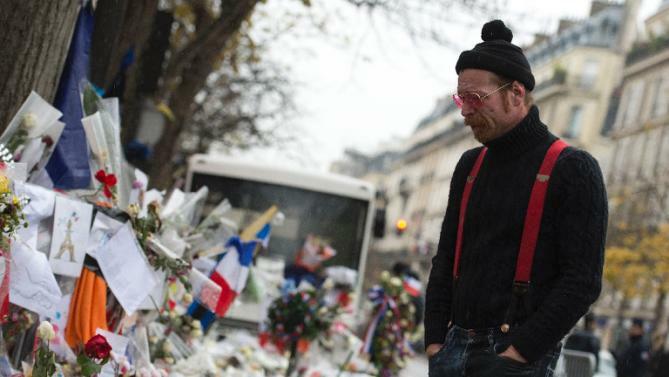 American rock band Eagles of Death Metal has made an emotional return to the Bataclan concert hall following the Paris terror attacks last month. The band’s members visited the concert venue to lay flowers in memory of the 90 concert-goers who were killed. Jesse Hughes, the band’s frontman, wiped away tears before speaking to a small group of fans at the site. Eagles of Death Metal made a surprise appearance on stage in Paris on December 7 when they took to the stage to perform with U2. They belted out the Patti Smith anthem People Have The Power at the concert at the AccorHotels Arena. A total of 130 people were killed on when gunmen attacked bars, cafes and restaurants in co-ordinated attacks on November 13. Most of the dead were in the Bataclan watching Eagles of Death Metal. The band escaped the carnage by hiding in a dressing room backstage and later told how they want to return to Paris to finish their performance. In a Facebook post, Eagles of Death Metal thanked U2 and said they had “reminded us that the bad guys never take a day off, and therefore we rock ‘n rollers cannot either… and we never will”. Eagles of Death Metal paid tribute to “everyone in the world who continues to prove that love, joy and music will always overcome terror and evil”.